Mubarak was spared that day, and still, three decades later, he rules. Rumors of poor health swirl around him, and the Egypt he has dominated for so long is a crowded, broken country. “I shot the Pharaoh,” Lieutenant Islambouli said, without doubt or remorse. He and his band of plotters had no coherent plan for the seizure of power. They would kill the defiant ruler, for them an apostate, make an example of him, and hope that his successors would heed his fate. 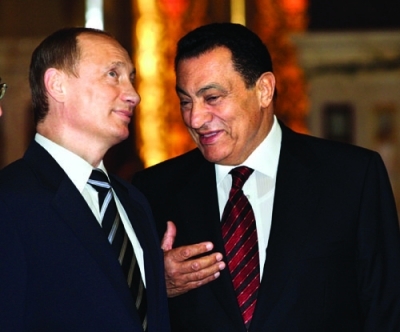 Egyptian President Hosni Mubarak, right, chats with Vladimir Putin during the Russian leader’s visit to Cairo in 2005. For thirty years, Mubarak’s authoritarian, secular state, with the army as its mainstay, has kept its grip on political power. Mubarak would confound the militants. In his years at the helm, he would stick to the big choices Sadat had made: he would stay in the orbit of the Pax Americana and he would maintain the “cold peace” with Israel. The authoritarian, secular state, with the army as its mainstay, would keep its grip on political power. But there is no denying that Mubarak had internalized the lessons of Sadat’s assassination. Where Sadat openly embraced the distant American power, flaunted his American connections, and savored the attention of the American media, Mubarak has had an arm’s length relationship with his American patrons. There was no need, he understood, to tempt the fates and to further inflame the anti-Western and anticolonial inheritance of his countrymen. America had come into Egypt in the aftermath of the 1973 October War. There were Egyptians who took to this new world and its possibilities, so keen were they to put the dreaded radical past with its privations and restrictions behind them. But a fault line divided the country. The pious and the traditionalists and those who believed that Egypt’s place lay in the Arab world were offended by this new order. Mubarak would take U.S. aid. Second only to the American subsidy to Israel, it was crucial to his regime. There would be joint military exercises with U.S. forces. But the Egyptian ruler was keen to show his independence from American tutelage. Mubarak was at one with the vast majority of Egyptians in his acceptance of peace with Israel. He hadn’t made that peace. It was not for him the burden it was for Sadat. Egypt was done with pan-Arab wars against Israel. She had paid dearly in those campaigns. Her national pride had been battered, her scarce treasure had been wasted, and the country had become an economic backwater. And so Mubarak honored the peace with Israel, but there would be no grand spectacles, no big visit to Israel, no stirring speeches to the Israeli parliament. This had been Sadat’s way. Mubarak was under no compulsion to come up with an “electric shock” diplomacy of his own. He would, under duress, make a single, brief visit to Israel in 1995 for the burial of Yitzhak Rabin. He said little. The memorable funeral oration was made by the Jordanian monarch, King Hussein. If Mubarak was spared the wrath of the traditionalists, it must be acknowledged that he has never led or defended a modernist course for his country. This was no Mustafa Kemal Ataturk pushing his people into a new culture and a new world. A suspicious autocrat, he has stepped out of the way as a toxic brew came to poison the life of Egypt—a mix of antimodernism, anti-Americanism, and anti-Semitism. Egypt has struggled mightily since the mid-1800s to belong to the modern world of nations. It had something of a democratic inheritance; the Mediterranean bordered this country and brought it its gifts. In the interwar years, there had been a parliamentary system. But this was not Mubarak’s impulse. He rules by emergency decrees and has suffocated the country’s political life, reducing the political landscape to something barren that he has been comfortable with: the authoritarian state on one side, the Muslim Brotherhood on the other. Nothing stirred or grew in the middle. No democratic, secular opposition was allowed to sprout. Mubarak would take U.S. aid. There would be joint military exercises with U.S. forces. But the Egyptian ruler was keen to show his independence from American tutelage. For Mubarak, the appetite grew with the eating. The modest officer of yesteryear had become a pharaoh in his own right. He flew under the radar, as Egyptian authoritarianism was never on a par with the kind of terror unleashed on Libya, Syria, or Saddam Hussein’s Iraq. He has refused to give his country an orderly process of succession. He would never name a vice president, even as his country clamored for one. By his own lights a patriot devoted to his country, he left it prey to the doubts and dark thoughts that cripple the life of “Oriental despotisms.” He let loose on Egyptians the steady speculation that he had in mind dynastic succession, bequeathing a big country to his son. In the police state he rules, radical Islamists are hunted down or imprisoned. The prisons are notorious for their cruelty. In time, Islamists from Egypt, survivors of its prisons, would make their way to the global jihad. They hadn’t been able to topple the Mubarak regime, so they struck at lands and powers beyond. A young physician, then thirty years of age, a Cairene of aristocratic pedigree, one Ayman al-Zawahiri was picked up in the dragnet that followed Sadat’s assassination. He was imprisoned and tortured, then made his way to the Afghan jihad and the world of terror, rising to second in command of Al-Qaeda. It was Zawahiri, learned but merciless, who drew a distinction between the “near enemy” (the regime at home) and the “far enemy” (the American patrons of the regime), and who opined that it was the permissible and proper thing to strike at distant enemies in preparation for bringing down the tyrant at home. In the same vein, a blind preacher from a once-tranquil town on the edge of Egypt’s western desert, Omar Abdul Rahman, quit his country for Jersey City and Brooklyn. He carried the fire and the rage with him to the new world, and was eventually tried and convicted for crimes stemming from the investigation into the 1993 World Trade Center bombing. Mubarak’s Egypt had grown skilled at channeling its troubles to distant places. No great upheaval has taken place in the Egypt of Hosni Mubarak. But the country on the banks of the Nile has stagnated. Its good cheer—one of its fabled attributes—has given way, and the crowded country is an unhappy, bitter place. A suspicious autocrat, Mubarak has stepped out of the way as a toxic brew came to poison the life of Egypt—a mix of antimodernism, anti- Americanism, and anti-Semitism. Egyptians had led the march of Arab modernity, and for decades they lived on that sense, and memory, of primacy. All this is of the past. Other Arabs have gone their way and negotiated their own terms with the world. A sense of disappointment now suffuses Egypt’s political and cultural life. There is peace with Israel, but it is unloved. There is a dependency on the United States, but one of bitter resentment on the part of most Egyptians. There are ideas of a big country at the crossroads of three continents, but the reality of an unimaginative autocracy. Grant Hosni Mubarak his due: he has not dispatched his countrymen on deadly expeditions and needless wars. He has kept the peace, he has been the cop on the beat. But Egypt needed and deserved something better, more ennobling, than a tyrant’s sterile peace. New from the Hoover Press is Syria through Jihadist Eyes: A Perfect Enemy, by Nibras Kazimi. To order, call 800.935.2882 or visit www.hooverpress.org.